with help from their four legged side kicks Ruger and Pickles. New to the herd is their daughter Harper, who was welcomed in July 2018. 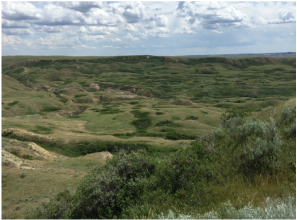 The Special Areas of Alberta encompasses roughly 5 million acres of land in the east central part of our province that was hit particularly hard during the Depression in the 1930's. After years of drought and hardship, many pioneers could no longer make their living off the land and left the area, abandoning thousands of acres. In 1938 the Provincial Government established the Special Areas Board, a governing body to provide municipal services and support the region. There are currently three of the original four Special Areas still operating under this unique municipal structure. The Williams family and their ancestors settled in Special Areas 2, where Whiskey Creek Ranch is today. A 5th generation rancher, Clay was raised just a few miles away from where Whiskey Creek Ranch is now flourishing. His family settled in the Cessford & Craigmyle areas, with the original homesteads on both sides of his family, still being lived on to this day. WL Farms, owned and operated by Clay's parents, run 250 head of red commercial cattle on the native prairie grasses of Special Areas, just as their parents did for generations previous. Growing up, if he wasn't on the farm, Clay could be found in the rodeo arena, starting out riding steers, then graduating to saddle bronc horses and bulls. To fuel his passion for livestock even more, he completed his Green Certificate, a program aimed at teaching young ranchers how to ethically and safely run cattle operations. A true entrepreneur with a mind for design, Clay received his Bachelor of Science in Engineering with a major in Oil & Gas from the University of Calgary. He puts his engineering skills to work nowadays as a water well driller and agriculture water provider with his company Legacy Drilling. While Jesse (Baron) was born and raised near Brooks, AB, her roots are buried deep in southern Saskatchewan where both her parents grew up on mixed farms. Jesse's maternal grandparents ran 'Martin Gelbviehs' near Cadillac, SK on their original homestead. Her grandpa Wayne Martin was one of the first ranchers to bring the Gelbvieh cattle breed into western Canada. Martin Gelbvieh's won their first Grand Champion Gelbvieh bull in 1988 at the Western Canadian Agribition. This was the first time they had ever entered the competition. Jesse grew up as an avid 4-H member, raising steers, lambs, pigs and horses through the 'Learn to Do by Doing' program. After graduating from the University of Calgary with a Bachelor of Biological Sciences majoring in Botany, Jesse integrated her passion for agriculture into her career as an Agricultural Fieldman for her municipality, serving the needs of producers in the area. Clay & Jesse married in 2011 at her parents operation, Baron Coulee Ranch near Brooks, AB. Because family is such an integral part of their lives, Clay and Jesse knew they wouldn't want to settle far from their loved ones. Starting with just a quarter section of land, Clay & Jesse started to build their ranch from scratch, only a few miles down the road from Clay's brothers, parents and cousins. Whiskey Creek Ranch has been growing rapidly ever since with sweat, blood & tears, but this ambitious couple wouldn't have it any other way. If you ever have the opportunity to visit Whiskey Creek Ranch you will likely run into one or two (or more) of their closest friends and relatives, as the coffee is always on and company always welcome.